Windows 8 is such a big change to Microsoft's operating systems (OS), we thought it might be useful to have a look at their plans for the types of devices that will use it and also their longer-range plans. Since Windows 8 became available in the TechSoup Asia program, we're covering different angles on what Windows 8 is all about. It may help to understand Microsoft's objectives with Windows 8 and Windows RT by looking at a surprising new crop of devices that have just launched that are designed for the new OS family. Probably the most intriguing new devices are the convertibles, which are hybrid tablet and laptop devices. These are also called slates. They run full-fledged Windows 8 and so will run full versions of other PC desktop software. Microsoft slates are designed to be as functional as a laptop, in a small touch screen form that weigh only a pound and a half. There's good evidence in the education market that many people are trying to replace laptops with tablets. This is a new type of PC. If you want to see what they are, check out the Samsung Series 7 Slate (above), Lenovo ThinkPad 2 Tablet, or ASUS VivoTab TF810C Tablet. The new touch screen ultrabook computers are more on the laptop side. Ultrabooks have been around for a while now. Ultrabooks are light, thin, laptop computers with long battery life and costs usually under $1,000. Apple's MacBook Air is generally considered to be the first ultrabook and has been around since early 2008. The newest ultrabooks now have touch screens so you can use them like a traditional point-and-click laptop, or move around by tapping, sliding, scrolling, panning, and rotating icons directly on the screen with your finger. These devices have the traditional laptop form factor but with a touch screen and a keyboard. The current versions cost a bit more than conventional ultrabooks. Examples of Windows 8 touch screen ultrabooks include the Dell XPS Duo Touchscreen Ultrabook (above) and the Toshiba Satellite U925t Touchscreen Ultrabook. They're a bit heavier than a tablet at around three pounds. The new Microsoft Surface tablet is essentially a tablet computer, like an iPad, but with a built-in keyboard that is part of the cover. It's called a Touch Cover. On the inside of the Touch Cover are the keys and a trackpad made from a fabric material. Microsoft itself makes and markets the Surface online and in its new retail stores in the US, Puerto Rico, and Canada. The current $500 Surface launch model runs on a version of Windows 8 called Windows RT. It is Microsoft's new mobile operating system, and somewhat different from PC-based Windows 8, but is in the same family of operating systems. It can't run any desktop programs except Microsoft Office and Internet Explorer. It makes the Surface more of a cloud-reliant device. In early 2013 Microsoft is planning to launch a Surface with Windows 8 Pro which is expected to be more full-featured, a bit larger, and more expensive. The Windows 8 all-in-one computers are iMac-type desktop computers that are mostly composed of a touch screen monitor. Unlike conventional desktop computers, the computer case for them is in the base of the monitor. They come in different monitor sizes, all the way up to 27 inches. They are primarily geared for consumers rather than business settings. The big screens are good for games, movies, and other entertainment, and like desktops they come with big hard drives and are heavy. The HP ENVY 23 TouchSmart (left) weighs over 24 pounds. Microsoft has been busy this 2012. Not only have they launched new stores with a variety of of tablets, slates, ultrabooks, desktops, and all-in-one computers that are all optimized for Windows 8, there is also a new line of smartphones called Windows Phone 8 Smartphones. 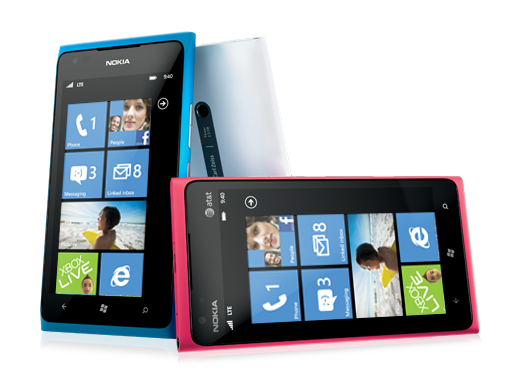 The Nokia Lumia 900 (above) is the flagship phone for both Microsoft and Nokia to compete with the Apple iPhone and Samsung Galaxy. Most major phone makers will be coming out with Windows Phone 8 smartphones like the HTC Windows Phone 8X and the Samsung Ativ S.
One key difference between Windows 8 and Windows Phone 8 is the display resolution. All Windows 8 Store apps will have to be relatively high resolution. In addition, the main Windows Phone 8 software features include a very close integration with Microsoft's SkyDrive cloud storage to store, retrieve, and sync photos between devices. It also integrates Live Tiles, which are apps that deliver automatic updates on what is important to you like your calendar, and Rooms, which let you create invitation-only spaces where you can privately share notes, photos, a calendar, and group chat with the people you choose. Why All These New Devices? Essentially the new Microsoft hardware and Windows 8 strategy is to make it easy for offices to have all their IT, including consumerized IT like phones and tablets, on a single supportable platform. Forrester Research just came out with a great report called Windows: The Next Five Years. In it, the author, Frank Gillett, describes how Microsoft is now rapidly shifting from its previous PC-only strategy (now less than one-third of all personal computing devices) to a world where both consumers and offices use multiple personal device types. Windows 8 and the new devices for it are only the most visible part of its strategy. The company is building a new programming model for applications, launching a new mobile app ecosystem, developing an array of cloud-based services, and developing new technologies that will be added across all their platforms involving touch, voice, and gesture. Windows 8 is only the beginning. The Forrester report believes that adoption of the new Microsoft computing ecosystem will be gradual, but will be start gaining momentum not just in PCs, but in mobile and cloud computing in 2014. Will you be jumping on the Windows 8 train? Or adding more touch screen devices to your organization's hardware? Share your thoughts in the comments below.